George was born in May 1892 to George Townsend and Elizabeth, nee Lowe. The family lived near The Stoops, Rainhill and the young George spent his holidays in Shropshire with his grandparents. In 1910, aged 18 he joined the Lancashire Hussars (577 later 250069) on a short service engagement at Rainhill. He attended two annual training camps in 1910 and 1911. On 29th October 1915 his squadron joined 30th Division at Salisbury Plain and he sailed to Le Havre at the beginning of November. Between 9th November 1915 and 8th October 1917 George was fighting in France with the British Expeditionary Force. Between 13th and 26th April 1916 the Squadron was attached to the 2nd Indian Cavalry Division before it re-joined 1/1st on 10th May 1916. In July 1917, the regiment was dismounted and sent for infantry training. On 28th September, 1917 George transferred to the King’s Liverpool Regiment and was posted to the 18th Battalion. In November 1917, he was posted to the 11th Training Reserve Brigade and in August 1918 he was discharged to a commission. On 13th August George was appointed to a commission as 2nd Lieutenant into the Cheshire Regiment Territorial Force and posted to 5th Battalion. He was wounded on 14th October 1918 at Menin and was admitted to the Western General Hospital, Manchester on 17th October. No further details were recorded. On 22nd January 1921 George was transferred to the Territorial Force Reserve of Officers (Infantry). Medals issued to George were: Territorial Efficiency Decoration and 1st Clasp, 1914-15 Star, Victory Medal, War Medal 1914-15, Defence Medal and War Medal 1939-45. 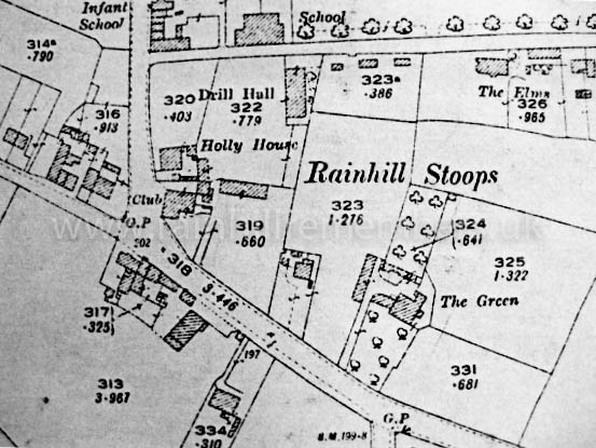 Rainhill Stoops is about 1 mile east of Rainhill Village on the A57 towards Warrington. This map of 1907 shows some of the houses that would have been built at the time George would have been living there.